Ed Ruscha began his commentary on language as a system in the early 1960s, most often exploiting the connotative power of a single word as a means of commenting on the contingent relationship of form to content. Later in the 1970s, Ruscha began employing evocative phrases and sentences to point to cultural conventions, myths, or ideologies. Ruscha’s use of language is often analyzed in terms of the direct and immediately comprehensible imagery of Pop. Yet it is through the shifting interrelationship between form and content—between what is said and implied—that the artist examines the political power of language. 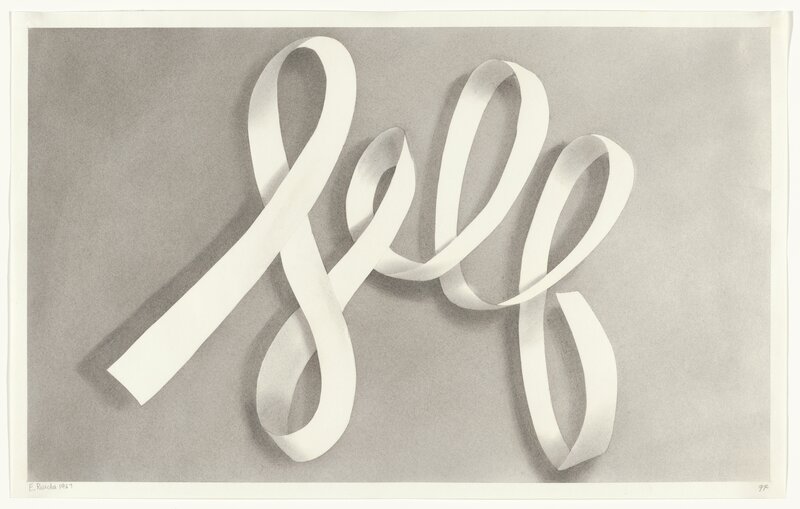 Self (1967) is Ruscha’s earliest drawing in the exhibition, and it provides a useful point of departure in examining the power of the linguistic to evoke the relationship between individual and group identity. In 1960s America, language began to re-enter the vocabulary of American artists, supplanting High Modernism’s four-decade promotion of abstraction. Pop is frequently theorized as an ironic response to Abstract Expressionism, which insisted on the autonomy of the image as evidence of the artist’s singular encounter with his materials.1 Pop images, when placed in dialogue with text, instead pointed to interpretative frames as referential and contingent, indicating our own deep engagement with popular culture. With Self, Ruscha enlists the political potential of Pop to speak to the constructedness of individual identity. By rendering the word Self in script, Ruscha gestures toward the autographic: the stable “truth” of the self as understood by High Modernism becomes a mere citation, a word, necessarily different in its shadings to anyone who reads it. By rendering the text in reserve and giving it the illusion of three-dimensionality, Ruscha turns this word into a scroll to be written on: the self as a screen. The drawing is part of Ruscha’s gunpowder series, which the artist began in the 1960s because he found graphite and charcoal lacking in their evocative potential. In 1967, at the height of the Vietnam War, Ruscha raises questions of individual responsibility for violence by illustrating the self with the materials of combat. In Self, text becomes image and image becomes text, allowing the word to act both as a physical object and as a conveyor of meaning. 1. Harold Rosenberg, “The American Action Painters,” Tradition of the New, originally in Art News 51/8, December 1952: 22. Harold Rosenberg, “The American Action Painters,” Tradition of the New, originally in Art News 51/8, December 1952: 22.